I've been on a natural and healthy route for a few years now. I started slowly with baby steps, and now I'd say 80% of the products I use are natural. Everything from hand soap, to shampoos, to cloth pads, etc etc. When I was introduced to Daisy Blue Naturals, I knew it would fit right in line with what I believe in. And I was right!! I had the chance to review the Shampoo Bar in Rosemary Mint, Bar Soap in Almonilla (Almond/Vanilla), Natural Bug Spray, Witch Hazel and Aloe Face Toner, Cooling Body Mist, Grapefruit Mint Lip Balm, Relax Aromatherapy Rollerball, and samples of Unicorn Soap, Sun Protection Cream and Lavender Lotion. I was hooked up with a bunch of new goodies to try out! 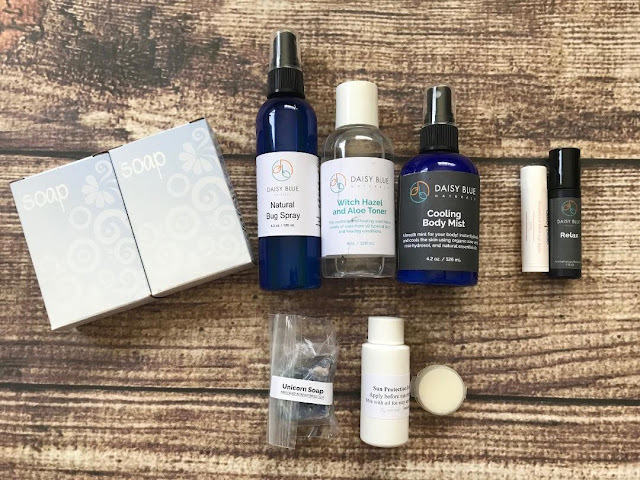 All of Daisy Blue products are Cruelty Free and are Sulfate and Phthalate Free as well as many others. All their products are natural and you can feel confident about using them in your home and on yourself and your children. The Rosemary Mint Shampoo bar is AWESOME!!! It lathers quite nicely and really cleans your hair well. I have oily hair and this made my hair and scalp clean and tingly. Loved the scent as well. Both bar soaps (Almonilla and Unicorn) are amazing as well. They give you that clean feeling while smelling amazing, also a great lather! Made with Olive and Coconut Oils, Shea Butter, Castor Oil, and more! The Cooling Body Mist is really neat. It's peppermint so it has that cooling effect. Sprayed on your skin, it makes you feel amazing! Perfect for after sun care. But also, I have no Air Conditioning, so it's perfect when we have SUPER hot days. I spritz myself and sit in front of a fan, I feel AMAZING after that!! The Lip Balm is a great scent/flavor as well. With Safflower Oil, Beeswax, Cocoa Butter, Hempseed Oil, Vitamin E, Rosemary Leaf and more, this lip balm is sure to hydrate your lips and keep them smooth! Daisy Blue offers the highest quality of products, at a very affordable price, ad you can be confident with your purchase. I love my new items and will be a repeat customer! Price: Cooling Mist is $15.99, Lip Balm is $5, Toner is $21, Soaps are $8, Shampoo bar is $12. Very affordable for natural products. Overall: ***** hands down!! LOVE them!